Simon Erridge of Bennetts Associates looks at the potential benefits of cultural investment, and uses Chester’s new Storyhouse development by the practice as an example. There has been a lot written on the subject of culture-led regeneration – with research often pointing to circumstantial evidence of the value of culture in meeting short-term economic targets. Yet, it is the long-term impact of cultural investment and funding happening over many years that are likely to be of lasting benefit; engaging communities, raising expectations and encouraging further investment. The Arts Council England’s revenue funding announcements increasingly favour locations outside London where arts funding has typically been less focused. The awards announced in June 2017 continued this trend. From my work with local authorities and arts clients I know that opportunities for culture-led regeneration exist in many regional UK towns and cities, particularly in areas of low cultural provision and investment, where grass-roots arts organisations are emerging and offer new models of engagement with artists and audiences. Capital projects are also being created, offering a different view about the place of cultural institutions in towns and cities. One such city is Chester where, in 2012, the new unitary authority of Cheshire West and Chester committed to the construction of the innovative project, Storyhouse, which opened last year. The desire for a theatre in Chester had been embedded in a wider strategy for the regeneration of the city following the closure of the city’s only drama house in 2007, but the innovation was to come in the evolution of the scheme’s brief, from a traditional ‘civic’ theatre to a uniquely diverse cultural centre; a place to combine theatre, cinema and city library in a single, publicly owned and community-occupied building. What started as pragmatism around the merging of library services into the new civic arts building created the opportunity to revitalise the city’s outdated library, the largest in Cheshire West, allowing it to become the unifying force that holds together Storyhouse and contributes to its diverse visitor demographic and lively, all-day atmosphere. Here a library is not a hushed room where talk is discouraged, nor is it a retail environment. Instead, it is more like a comfortable house where you can read, engage with media, but also linger, think, talk, meet and relax, with books as a backdrop. I believe this leap in ambition directly addresses the needs of wider cultural regeneration, with the creation of a day-long building with no barriers to engagement. Investment in cultural projects has wideranging regenerative benefits, and the model of Storyhouse shows how a single project can set out to tackle a wide range of issues. Typically, the benefits of cultural regeneration are categorised as environmental, economic and social. 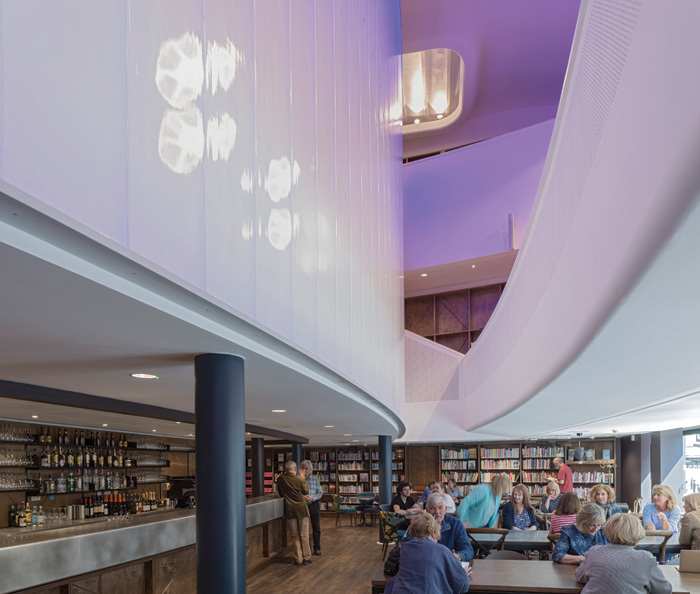 In the case of Storyhouse, it is possible to see how the project emerged in a way that directly addressed each of these benchmarks, creating a powerful combination that engages city, building and community alike. The project presented an opportunity to physically regenerate an important part of the historic city, and to help reverse a trend towards a late-night drinking culture and antisocial behaviour, which threatened Chester’s attractiveness to weekend visitors and families. Chester’s 2012 One City Plan identified strategic moves within the Northgate area of the city, which would see the existing bus station and Sixties-built shopping centre replaced by a new retail quarter, and the former Odeon Cinema, also closed in 2007, converted into Storyhouse. The choice of the former Odeon was important. Until 2012, the site had been in private hands and, after the cinema was closed, plans were afoot to create a large nightclub on the site. The Odeon was also a building of tremendous cultural significance to local people. Constructed in 1936 and now Grade II listed, the building held the collective memories of the wider community and was much-loved. The building was acquired by Cheshire West in 2012 and a design team was appointed, enabling the project to progress quickly towards planning and construction, in effect, spearheading the regeneration of the Northgate quarter ahead of the other projects in the wider plan. The scheme required the extension of the old Odeon to accommodate the new main theatre and studio spaces while the Odeon itself was remodelled internally to create the large cafe and foyer space. The focal point of the building would incorporate the old Odeon’s art-deco plasterwork, a new cinema screen, a cafe and bar as well as 700m of book shelving including a dedicated children’s library. Re-occupying the old building brought its facades and entrances back to life, while the new extension opened up a new frontage on to what had been the city’s bus station, soon to be transformed into a new network of retail streets. The £38m capital cost of Storyhouse was largely funded by Cheshire West and Chester Council with contributions from Arts Council England, corporate sponsors, trusts and foundations. Revenue costs were a combination of commercial activity, Local Authority and Arts Council England funding. However, the project is part of a wider economic catalyst for Chester that aims to see its declining evening and visitor economy reversed through investment in strategic projects, including Storyhouse and the retailled Northgate development. 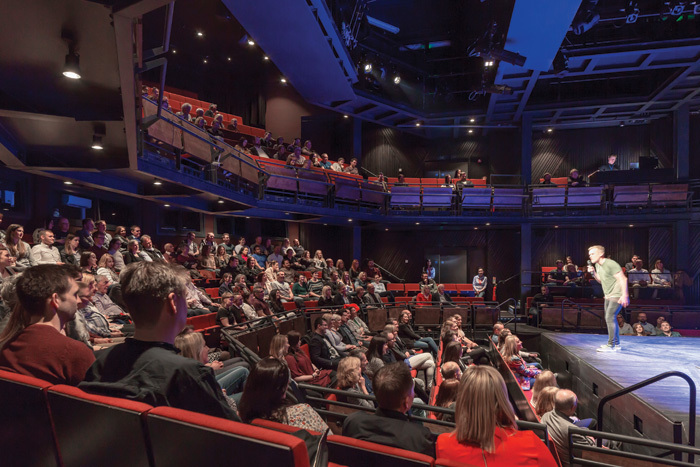 Storyhouse offers an innovative model for staffing and running a performance building, honed by a team that, in absence and advance of the completion of Storyhouse, was successful in maintaining a programme of festivals and outdoor theatre. Working without a building has brought innovations to the running of Storyhouse including ticketing (no physical box-office), pricing (flexible pricing using the low-cost airline model), hospitality (the importance of customer service to the visitor experience) and staffing (using one pool of flexible staff to run the entire building). The procurement process also followed best practice and was designed to keep the majority of capital investment in the local area and North West Region, by using the North West Construction Hub procurement framework, which prioritises regionally based contractors and their supply chains. The direct economic impact and influence of the completed building, which has around 150m of frontage to two main streets and Chester’s Town Hall Square, and its thousands of visitors, is already being felt with shops and businesses in the area refreshing their appearance to take advantage of the influx of new people Storyhouse has brought to this quarter of the city. There is also a social dimension to the project. I have found it goes beyond the provision of a new public building for the city. I was struck by the sense of ownership which Chester’s public now has for Storyhouse which has arisen through the previous lack of provision, the choice of site, and the engagement of people during the process of design and construction. Chester had been without a theatre or cinema in the city since 2007. Drama and film were kept alive in the city through grass-roots organisations and volunteers using community buildings and even outdoor spaces during the summer, but there was a very strong desire for a permanent building to open up greater artistic possibilities year-round. Meanwhile, the listed Odeon had been closed since 2007 and was seen as a deteriorating and increasingly negative presence in a key part of the city. The public engagement process around the project rekindled people’s memories of the Odeon by commissioning film and arranging visits to the building itself to collate memories of the building. The project team explained how the Odeon could be radically transformed in a way that had the potential to redefine how libraries and cultural centres are perceived while, at the same time, preserving and repurposing the key elements of its brick facades and art-deco interior. This process was carried out in public meetings, exhibitions and one-to-ones with key individuals and groups. It built support for the project and at the same time created future visitors and audiences. The design responded to the social need to create a building that would feel completely accessible and welcoming to the widest range of people. 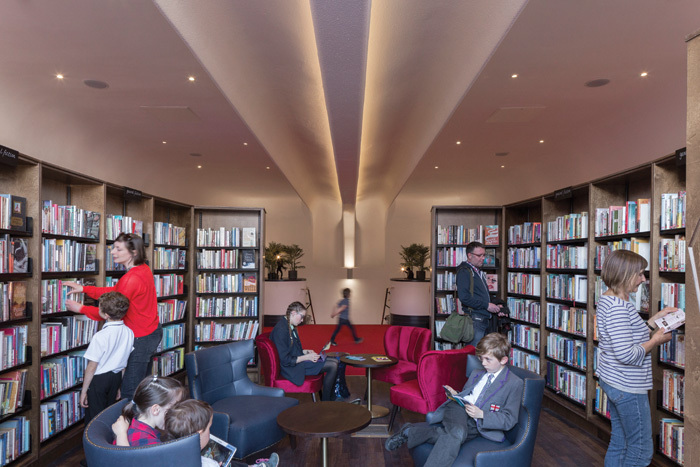 The name ‘Storyhouse’ deliberately suggests a move away from the trend for libraries with a retail feel to a more domestic series of spaces where drama, film and literature can be brought together. The tagline ‘This house is your house, what are you going to do with it?’ hints at the importance of the community agenda in its use and programming. 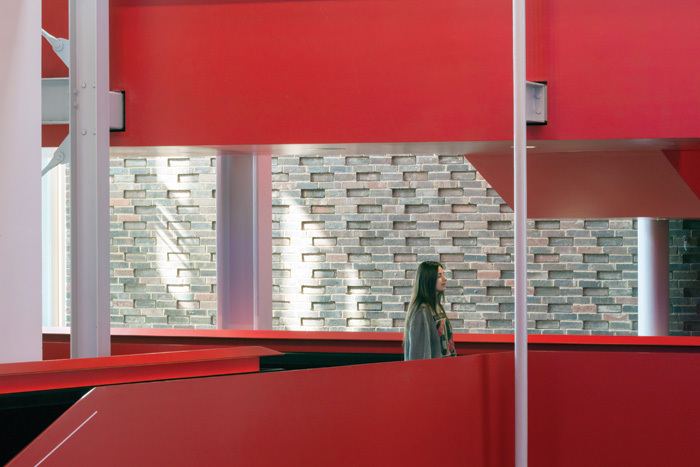 The main spaces in the building – the theatre and cinema – are programmed and ticketed throughout the year, but many others are available for community use. These include a studio theatre and bar, storytelling room, meeting rooms, messy play space and book-lined library spaces. Uses as diverse as coding workshops, book groups and a youth theatre are accommodated seamlessly in the building. Storyhouse offers opportunities for volunteering, but also provides employment and apprenticeships. Schemes for under-26s include Reading Hacks, Young Company and a Young Leaders programme, introducing young people to a potential career in the creative industries. Lessons for other UK Towns and cities Storyhouse’s content has been created to connect with Chester people and to have relevance to the issues facing the world now. These include a rewriting of John Gay’s The Beggars Opera, set in Chester, and a contemporary take on Shakespeare’s Julius Caesar, which begins with a political rally in Storyhouse’s foyer before heading into the main theatre space. In May, the Women of the World festival took over the entire building for a weekend of inspirational events, talks and activities celebrating women and girls, and looking at the obstacles that stop them from achieving their potential. After only a month we have identified lessons from Storyhouse which should resonate with other UK towns and cities. There have been 78,000 visitors, 10,000 books checked out, 1,000 new library cards issued, 9,800 coffees sold, 100-plus cinema screenings and 30-plus theatre shows. 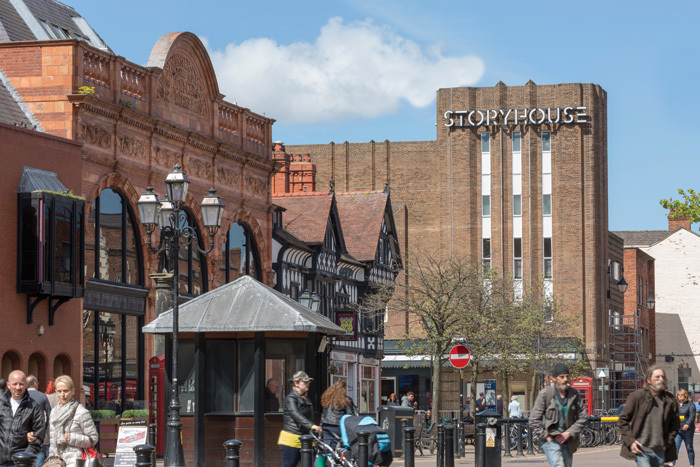 The capital investment has been significant, but the way in which Storyhouse has spearheaded the transformation of Chester’s Northgate and the way in which it revitalises a much-loved historic building are evident when you visit. Other innovative features include the combination of library services with other cultural provision, staffing across disciplines, programming by one artistic team and the wide engagement of community organisations and volunteers in its design and its operation. All of which makes Storyhouse’s model an innovation in culture-led regeneration that will provide a benchmark for many other local authorities.